Last year I started a blog post about librarians and job seeking. It was inspired by my own struggles finding employment after moving to a remote area of the mid-Atlantic, as well a response to a few librarian searches we were conducting at my current place of work. That post got out of hand. It was long, it was rambling, and it definitely felt like more than a blog post. After sharing it with a few colleagues and editing it down significantly, I was encouraged to submit it as an opinion piece to C&RL News, which I did. Now it’s in print! 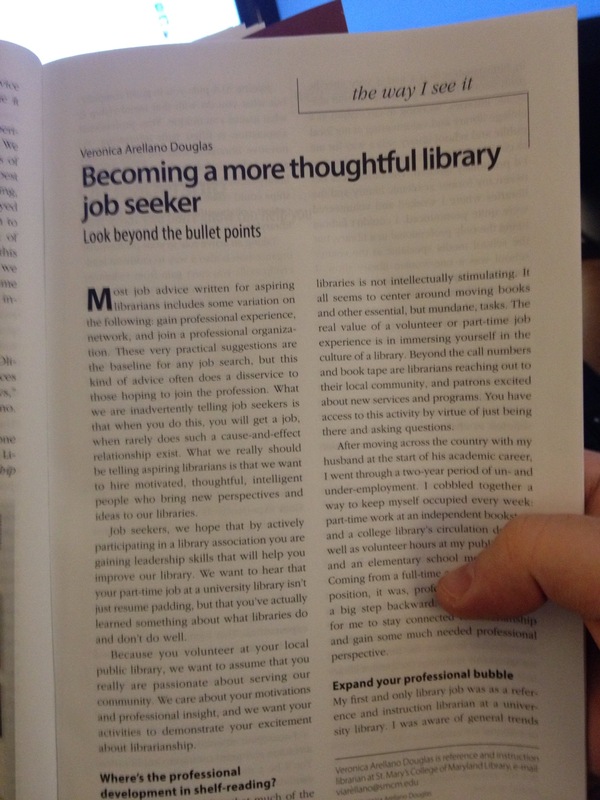 Becoming a more thoughtful library job seeker is this month’s The Way I See It column, and I’m pretty psyched about it. It’s been a few years since I’ve seen my name in print next to anything other than a book review, and I’m hoping that this publication will help grease the wheel of my writing brain a bit. I’d love to hear what you think about it! Props to my new library friend Kyle Denlinger for the photo!